We love our LEGO® toys and we want to show you some fantastic stuff we've been creating over here in Perth, Western Australia. In late 2007, a small group of like-minded adult LEGO® enthusiasts met up Sunday mornings to create a train and town layout for the 2008 Model Train Show. We won Most Popular Exhibit and had a great time running the display. A few more people have joined the group since then, allowing us to build bigger and better displays filled with unique creations. More is coming in the following months leading up to June, when we pack up and head to Claremont Showgrounds for the Model Train Show. Lots to do still so keep checking back. Did you know? 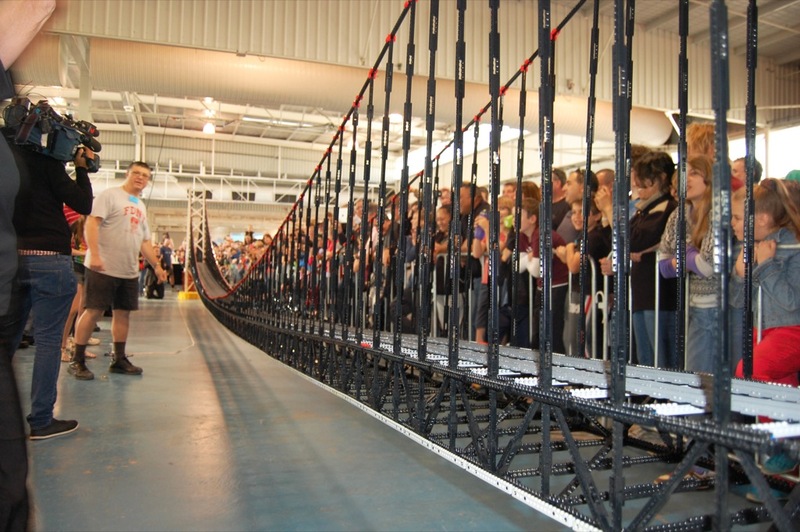 The club president designed and built the longest LEGO® bridge in a layout in 2013! 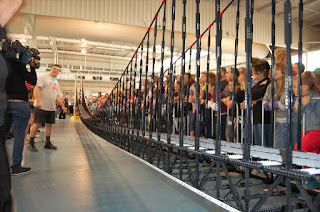 Testing out the record-breaking bridge! Are you looking to play a bigger role in the local LEGO® fan community? Do you want to meet other LEGO® fans with a passion for building? The WA Brick Society wants you! Join the club and wow us with your building skills! Just send an email to perthpals@hotmail.com so we can let you know where and when to come along. If you have skills, experience or hobbies in other areas besides LEGO®, you can be of further help to us! We are always looking for help in areas including engineering, display planning, storage organisation, photography and publicity. For membership forms and fees, refer to the documents in Downloads section. The WA Brick Society display models and layouts at a number of events throughout the year with the biggest display being the Model Railway show at Claremont Showgrounds over the WA Day long-weekend. Should you be interested in having WABS hold a display you are welcome to inquire by emailing the club secretary: perthpals@hotmail.com. A WABS display will always depend upon the availability of club members and costs are involved. Cost will depend upon the length of time of the display; location of the display; the cost of transporting the display to the venue and whether LEGO® may need to be purchased. For information about LEGO® clubs and building workshops for children, see the Clubs for Kids section of our blog.